So, after a slight bout of silence, to which my Central European fans have started complaining about, I am back. The reason for the delay was simply that I was busy with running errands and doing things. I have a number of articles and book chapters that I need to read before I head over to Denmark, and so that I would not look stupid when I get there. Some preliminary reading, I suppose. After all, this is a week-long intensive course. So I am doing that. I also am reading grant proposals again, since I am once again a member of the review committee for a funding source here in the university. So I am reading quite some applications coming in from different departments, ranging from comparative literature to physics. And, I am also trying to coordinate with some of the members of the lab of another department, since I am planning to join that within the next few months. So there, it is the summer, school is not in session, but it is still a busy period. I finished my surreal book the other day. It was about the very fertile guy, who impregnates every woman he sleeps with. It was ok, nothing spectacular to write home about. So, I returned that to the library, and I picked up another one. 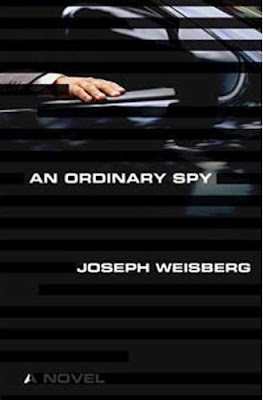 This one is called An Ordinary Spy, by Joseph Weisberg. It is the story of a spy who was sent to somewhere. The funny thing about this book is that there isn't a page where there isn't a word that is redacted. Yes, parts of the prose are hidden in black ink, and so I don't even know where the guy is sent to. It starts as him being recruited by the CIA, and then he undergoes training, and he is sent to some country. I have to fill in the blanks for the most part. But still, it is intriguing. So there, nothing new and special for my part, at the moment. I am still here in terra firma, for the next three weeks. And when this three weeks is up, I will be on the move again.